I’ve been practicing my plein air technique in weekly outings with a friend from Auburn. 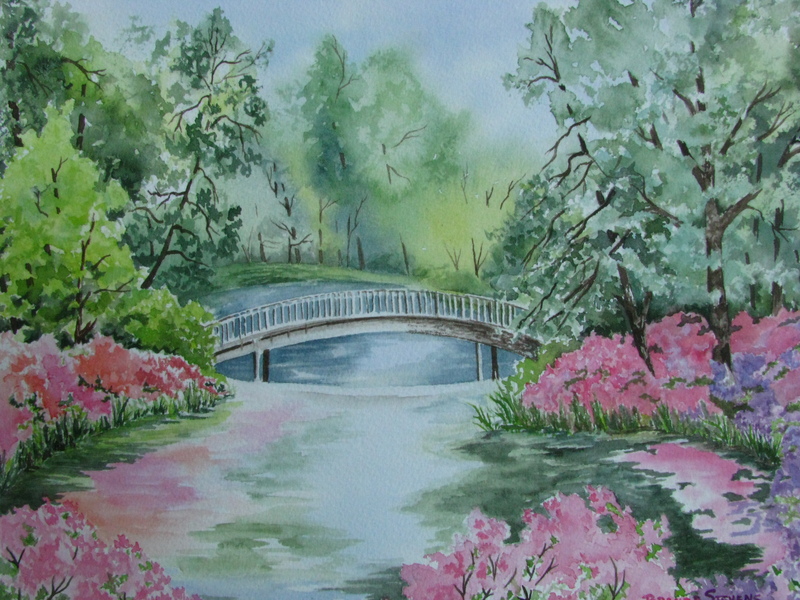 We’ve been traveling to Callaway Gardens for the purpose of painting the azaleas during the Spring Festival. The beautiful colors lasted about three weeks; first at the Azalea Trail/Overlook, then at the Azalea Bowl. I completed this 9 x 12 painting in two sessions, about six hours. The following week, all the azaleas were brown, which was quite a shock after brilliant color on the previous visits. I chose a limited palette of permanent rose, scarlet lake, cobalt blue, prussian blue, new gamboge and aureolin. The highlights and other whites are the white of the paper, which I simply painted around. I’ve started a second painting, this time in my studio. I’m working from a few photographs I took at the Sibley Horticultural Center last week. My subject is the swan sculpture in the reflection pool.